Flashy processed foods flood most of our grocery store shelves. While using some lightly processed products is okay, in the long run it is healthier, cheaper, and tastier to make some commonly processed foods at home instead. Try making these 6 generally processed foods at home instead of scribbling them on your next grocery list. Soup & stock. Instead of buying canned soups — which are packed in BPA-lined cans — and boxed stocks — which are generally lacking in flavor, take 30 minutes to make your own. Making stock is easy. Just throw leftover bones, herbs, and veggie scraps in a slow cooker and leave them overnight. Strain the liquid through some cheesecloth and into a jar and viola! You’ve made a couple of quarts of stock that you can pop into the freezer until you’re ready to use them. For soups, just chop up some veggies and some protein, and toss in according to cooking time. Most soups take only 30 minutes or so, and are incredibly nutritious and hearty, so don’t be intimidated by making your own. Nut butters & milks. Many nut milks contain a thickening agent called carrageenan, which can cause intestinal inflammation for some. The best bet to avoid unwanted additives is to make your own. It’s incredibly simple, and tastes infinitely better than the cartoned version. As for nut butters, it is more cost effective to buy nuts in bulk and create your own nut butter in a food processor, and only takes about 20 minutes of your time. Salad dressing. If you’re trying to avoid sugar, you’ve probably been surprised by the nutritional facts on your salad dressing. What’s incredible is that many people don’t realize that homemade salad dressing is incredibly simple and significantly tastier than the store-bought variety. It also allows you to control exactly what goes in, so you have complete control over what you’re consuming. It makes salad even more guilt-free. If you’re trying to avoid sugar, you’ve probably been surprised by the nutritional facts on your salad dressing. What’s incredible is that many people don’t realize that homemade salad dressing is incredibly simple and significantly tastier than the store-bought variety. It also allows you to control exactly what goes in, so you have complete control over what you’re consuming. It makes salad even more guilt-free! Tomato sauce. For one, tomatoes and their saucy cousins that are kept in cans generally have significantly more BPA leeching due to their acidic nature. So, it’s best to go for whole tomatoes or tomato paste sold in glass jars rather than cans. Secondly, many tomato sauces are loaded with unnecessary sugars or thickeners. Making your own is as easy as tossing some garlic, cherry tomatoes, basil, and olive oil into a saucepan to simmer. Once it has broken down and reduced a bit, you have a terrific tomato sauce that tastes as fresh as it is! 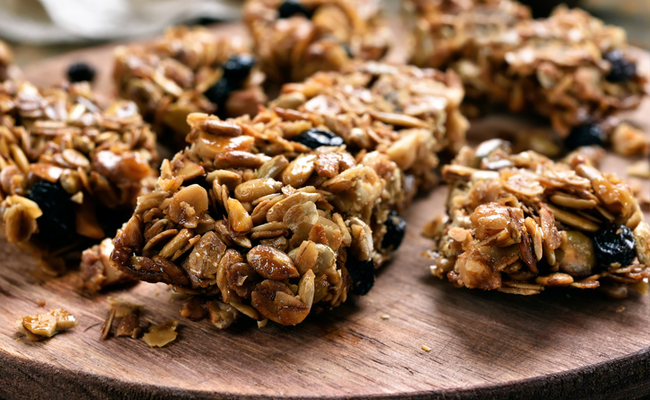 Granola bars. Buying energy bars is tricky. While sugar is a great energy booster if you’re an athlete, the quality and quantity of sugar are often all wrong. Instead of buying bars laden with GMO corn syrup, make your own at home. It’s easy, makes your home smell delicious, and is often a far more sugar-conscious choice than bars you can find in store. Salsa. Many reputable salsas actually contain thickening agents and unwelcome preservatives. Yet, few people realize how simple it is to make your own. For a killer salsa fresca, toss chopped tomatoes, onions, salt, cilantro, lime juice, and a hot pepper of your choice into the food processor and pulse until smooth. For an even richer flavor, fire roast the ingredients first. This salsa can even be frozen in a jar and saved for another time. Save money, boost flavor, and still fit in all of your chores. These processed foods are simple and quick to make. Try making one or two of them every Sunday afternoon to prep your household for a terrific, tasty week!